Can mongooses be trained to sniff out smuggled heroin? Ron McMullen knows the answer to that question. PHOTO: TOM JORGENSEN/UNIVERSITY COMMUNICATION AND MARKETING Former U.S. 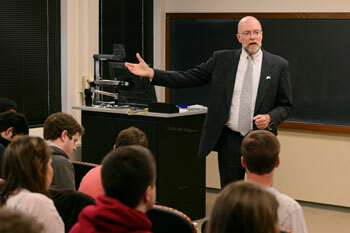 Ambassador Ron McMullen, visiting associate professor in the UI Department of Political Science, leads a class discussion this past spring. McMullen recently retired after a 30-year career with the U.S. Foreign Service that took him to 91 countries, including the Dominican Republic, Gabon, South Africa, Fiji, and Burma. As a diplomat, he met kings and presidents, including one of his personal heroes, Nelson Mandela; worked with poor indigenous communities; and occasionally found himself in dangerous environments, dodging bullets and negotiating sensitive deals. His encounter with mongooses came in Sri Lanka, where the Tiger Tamils terrorist group was smuggling heroin into the country in shipping containers. Although Sri Lankans don't traditionally see dogs as working companions, they use mongooses to keep snakes out of their gardens. So, with the aid of a $50,000 grant and a zoologist, McMullen helped organize an operation to train the animals to detect the illegal drugs. "The mongooses were to be released into a full shipping container," McMullen recalls, "and if they found heroin they would emerge with their tails all a-bristle." Unfortunately, a very bloody Maoist uprising and McMullen's departure from Sri Lanka soon afterward meant that Operation Mongoose was never implemented. His close relationship with Nobel Peace laureate and political leader Aung San Suu Kyi in Burma proved more productive. When the Burmese government put her under house arrest, Suu Kyi would sometimes slip McMullen messages rolled up in the hem of a purple longyi (a sarong-like garment widely worn in Burma) as she sent it out to the laundry. The first note alerted McMullen to the fact that she was going on a hunger strike, while another contained information intended to help the U.S. embassy's work to support pro-democracy activists. Wherever they traveled in the world, McMullen and his wife, Jane Eckhardt McMullen, 76BA, 78MA, 89PhD—both natives of the Hawkeye State—always felt like Iowans. In fact, they displayed in their residences overseas a print of Grant Wood's Young Corn. When McMullen retired from the Foreign Service in 2012, it felt natural to come back to Iowa. As a visiting associate professor in the UI College of Liberal Arts and Sciences' political science department, he now shares his diplomatic adventures with students. His global perspective also proves useful for students wondering whether they should study abroad, join the Peace Corps, or pursue overseas internships.